When you are searching for a financial advisor, what you are looking for is a Chief Financial Officer to help you run your family’s financial affairs. You’ll want to interview several potential candidates and make sure you find the right person for the job. Your interview will involve asking the financial advisor questions. You can ask about credentials and experience, but since you are hiring someone that has expertise that you don’t have, it can be difficult to determine if they are just a good talker, or if they genuinely have the right qualities for the job. To help you see through the “sales talk,” we’ve compiled a list of five practical interview questions. The questions are designed so that you can use the answers to determine qualities like integrity and communication skills; qualities every good financial advisor should have. You can ask these questions over the phone in about 15 minutes, and thus use them to help you pre-screen potential financial advisors, or you can ask them face-to-face. Any good financial advisor will have an area of expertise. You want someone who has expertise working with people like you. If you’re about to retire, and they tell you they work with young families, maybe this isn’t the person for you. Find a financial advisor whose ideal client sounds very similar to your situation concerning age, stage of life, and asset level. Don't hire a financial advisor that has less than four years of experience working as a financial planner. You’re talking about your life savings. A potential advisor may have years of experience as a CPA, or in the mortgage or banking industry, but that doesn’t mean they have expertise in delivering financial planning advice where each area affects another. Along with years of experience, you may wish to ask the advisor what subjects they are most interested in pursuing. Their answers should reflect subjects that are pertinent to their ideal client. If they say they work with retirees, but they are most interested in actively trading currencies, that should concern you. 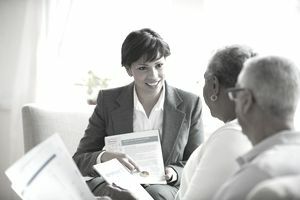 An advisor’s continuing education and professional interests should be aligned with the type of client they work with. What you are looking for here is, can you understand their explanation? If they speak over your head, or their answer makes no sense, ask for clarification. If you still don't understand the answer, then move on. You want to work with someone who can explain financial concepts to you in a language you can understand. What is passive vs. active investing? How do you determine how much of my money should be in stocks vs. bonds? What is a laddered bond portfolio? How do you determine how much money I can safely withdraw each year without running out? What do you think of annuities? A retirement planning projection helps you see how much money you will have available to spend each year, from now through life expectancy. The projection is based on assumptions about the rate of return at which your assets grow, the pace of inflation, and your spending habits. You want someone who uses a conservative set of assumptions; after all, you’d rather end up with more than what is projected, not less. A conservative set of assumptions would be growing financial assets at 5 - 6% a year, using an inflation rate of 3% (meaning personal expenses go up by 3% a year), and, if real estate assets are to be sold later, using only a 2% annual growth rate for them. I have seen financial plans run using 12% rates of return on savings and investments while assuming a 2% inflation rate. While this set of assumptions makes the future look rosy, it’s make-believe. You need realistic projections to make appropriate decisions. The key here is to listen for an honest answer. A financial advisor should be willing to explain all the fees you will pay to them, and all expenses you will pay associated with any investment they recommend. Answers such as “My company pays me,” or “You won’t pay anything out of your pocket” are not acceptable. Common sense tells you that a person’s primary loyalty will be to the hand that feeds them. If they are paid directly by fees from you, as in the case of a fee-only financial advisor, then they will have an incentive to provide advice and service that is in line with your goals. If they are paid by commissions or fees that are filtered through a broker-dealer, then they are first and foremost bound to the products their broker-dealer prefers them to use. The CFP Board offers a guide called Questions To Ask When Choosing A Financial Planner. Another organization, the National Association of Personal Financial Advisors which is a membership group for fee-only financial planners offers a guide called NAPFA’s Financial Advisor Checklist and Financial Advisor Diagnostic Tools. When asking questions, don't ask questions you don't understand. It will be best if you decide on a set of questions which you ask in your own words. This is the best way to be sure you can have normal, human conversations with the person you will hire. What Will a Good Retirement Planner Do for Me? What Will a Good Investment Adviser Do for Me? Quiz: Do You Need a Financial Advisor? Is Your Financial Advisor Telling You Everything You Need To Know?